1. Note, that the SI570 comes in several versions, most of which (e.g. the CMOS version) are not capable of working up to 1.4 GHz! I have used the fastest available LVDS version here. For more information on different speed grades look at the most recent SiLabs SI570 data sheet. 2. For a signed Windows7/Windows8 driver (works for all Windows versions) see Fred Krom's Webpage! Many thanks, Fred! see: T. Baier, "FA-SY als temperaturkompensierter Kanaloszillator", FUNKAMATEUR 12/2012, S. 1291-1293. 23.7.2012: Firmware updates to hopefully finally disable the safety flag. Read firmwareupdate.txt in the USB_SYNTH_LCD_V3.zip archive. 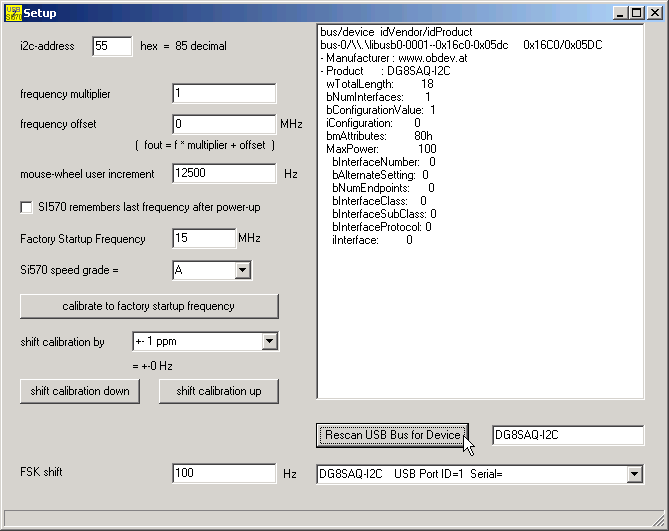 08.9.2011: USBSynth4 can generate MEPT transmissions, see here for details on MEPT. 11.9.2010: USBSynth3 can control several synthesizers connected at the same time, see here for details. 30.7.2008: Firmware version V1.4 uploaded. 18.7.2008: Uploaded a new easy to use PC-program to control the synthesizer via USB. Kits: You can buy kits here. Kits, boards and special components will be available from DL based Funkamateur for German customers and from UK-based SDR-Kits for other country customers. I have written the host (=PC) software in Delphi, but there are also a lot of demos coded in C on Objective Development's webpage. The binaries and sources of the firmware and Delphi host software including a free LibUSB driver can be downloaded from here. Also available: Easy to use PC software to control the synthesizer. The firmware is written in a flexible way allowing to interface any I2C-device without firmware changes. Only the host software has to be adapted. A more detailed description of the device and software is published in the June 2008 issue of Funkamateur. Pressing the button "Rescan USB Bus for Device" will scan for all connected USB Synthesizers. With the combobox below the button you can select the synthesizer to be controlled. Note, that by selecting another synthesizer, the original one will remain at the last set frequency. Also note, that the freshly selected synthesizer will be set to the frequency displayed in the main window. Thus selecting a new synthesizer will generally change its frequency, since individual frequencies of several synthesizers are not memorized in the Windows software.